For those who are familiar with this year's changing weather patterns in New York State, you will not be surprised at this bit of interesting information. On Easter Monday, Lady Winter dropped in on Long Island leaving her calling card, but left no traces of snow in Syracuse where I was visiting my sister for our family's Easter gathering. Then, on Tuesday, as we traveled back to Long Island, pelting rains and grey skies followed us all the way home. There was a chill in the air, reminding me that winter was making its presence known in the early days of spring. of earth's soon-to-be snowy room. Does this give you a hint at what is coming soon to Long Island? If you guessed snow, you are correct. 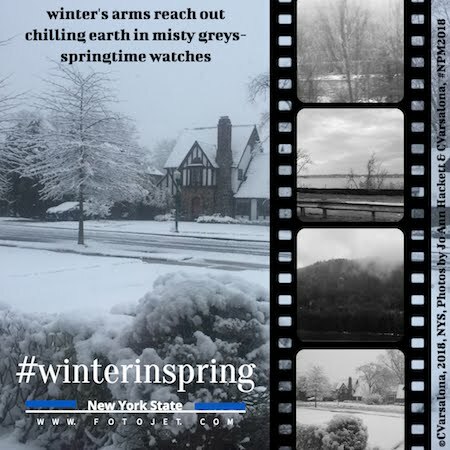 I created the hashtag, #winterinspring, because of changing weather patterns here on Long Island. While some are dismayed, I am enjoying the weather play that has provided me with rich content for my poetry writing this month. Of course, the #winterinspring motif is also a great backdrop for me while I continue to design my global winter gallery of artistic expressions, Winter Wonderland. Stay tuned for the gallery's grand opening during National Poetry Month. 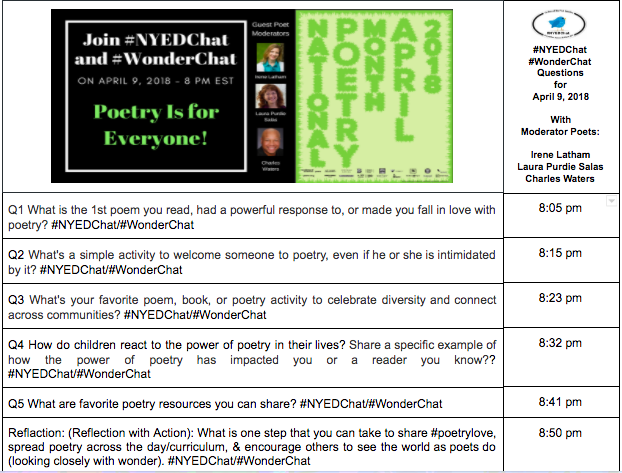 Speaking of National Poetry Month, please join me this Monday night at 8 p.m. EST for an amazing Twitter chat with #NYEDChat and #WonderChat as we explore "Poetry Is for Everyone" with my guest moderator poet friends, Irene Latham, Laura Purdie Salas, and Charles Waters. John MacLeod from Wonderopolis will moderate with me and send out each question we have designed during the chat. Here is your sneak peak. 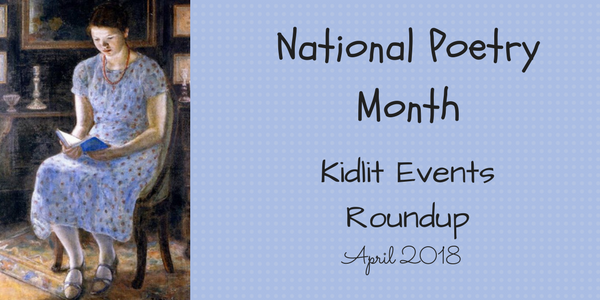 Today I join Amy Ludwig VanDerwater at The Poem Farm for Poetry Friday where she is celebrating National Poetry Month with her "1 Subject 30 Ways" poem project. Special Thanks to Jama Rattigan for mention in her comprehensive National Poetry Month happenings' post that you can find here.